One the much-anticipated events for the markets this week is the parliamentary vote on UK Prime Minister Theresa May’s revised Brexit plan on Tuesday. MPs will vote on a number of amendments to Mrs May’s bill that was rejected overwhelmingly a couple of weeks ago. We won’t know until Tuesday which of the amendments will be selected for the votes. But the Irish government has warned that any changes to the backstop arrangement, which is aimed at preventing a hard border being formed between the Republic and Northern Ireland, will not be accepted. So, we are not sure exactly what the PM’s revised plan looks like, but there have been suggestions that it is not going to be too dissimilar to her initial proposal. In the likely event the parliament rejects it again, uncertainty will remain elevated. But no one is quite sure what a defeat will mean for the Brexit process and how the pound may respond. While on the one hand it will technically increase the chances for a no-deal Brexit, which would be a bad outcome for sterling, another potential defeat for the PM would also boost the prospects of a second EU referendum, which we think would be positive. The pound has been pushing higher over the past several weeks as investors continue to expect there will be a delay in Britain’s official departure date of March 29. It is expected that the potential delay will either give rise to a second EU referendum or a soft exit from the EU, which is the default position of the UK parliament. 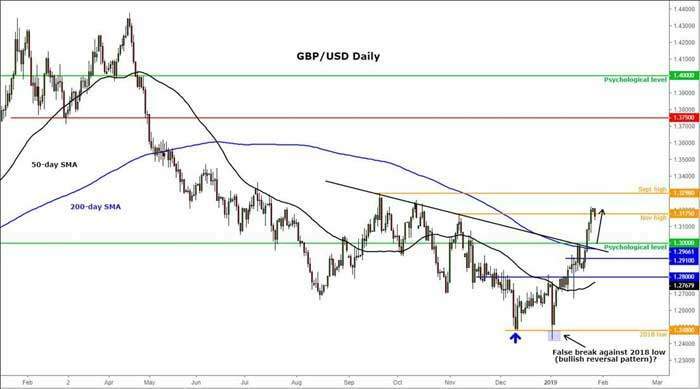 As expected from our previous update, the pound has indeed pushed further higher to reach and breach its old high around 1.3175, hit back in November. It has yet to test liquidity above the other high at just below the 1.33 handle hit in September. But the path of least resistance clearly remains to the upside until and unless there is a breakdown in the market structures of higher highs and higher lows. Still, we wouldn’t be surprised for a bit of a pullback now ahead of the key vote on Tuesday.